WBO cruiserweight champion Oleksandr Usyk won a close 12 round majority decision on Saturday night against WBC cruiserweight champion Mairis Briedis in thier semifinals fight in the World Boxing Super Series at the Riga Arena in Riga, Latvia. The scores were 115-113, 115-113 for Usyk, and 114-114. Briedis seemed to fade after the 2nd round. Usyk came on to dominate until the later rounds. Briedis fought well in rounds 1, 6, 9 and 12. It wasn’t the kind of performance from Usyk that suggests that he has the talent to move up to heavyweight to challenge Anthony Joshua. Usyk doesn’t have the power to compete at heavyweight. Usyk needs to worry about trying to beat the winner of the other semifinals match in the World Boxing Super Series between Yunier Dorticos and Murat Gassiev. Those guys hit hard, and Usyk is going to need to take some major shots to beat the winner of that fight. Unless Usyk is planning on facing weak opposition at heavyweight he gets a big money cash out fight against Joshua, he should stay at cruiserweight. Usyk does not have the natural size or the power to compete with IBF/WBA heavyweight champion Anthony Joshua or WBC champion Deontay Wilder. Usyk has decent but not great hand speed, but his power is not there. 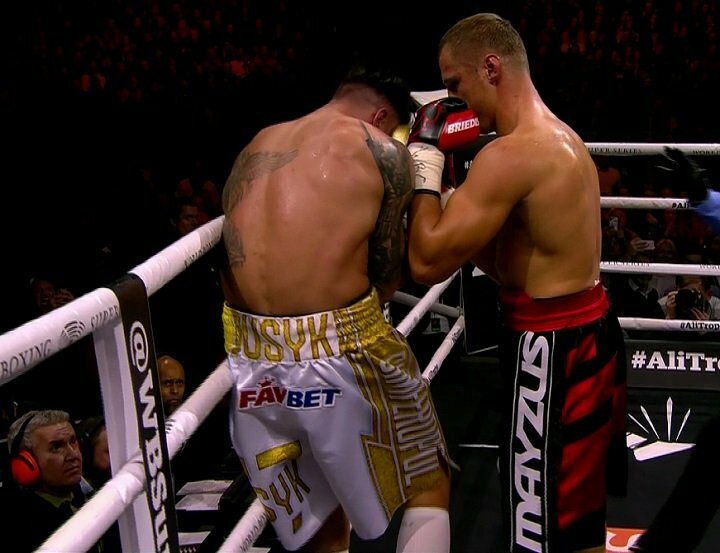 Usyk was caught all night long by Briedis’ best punches. If that was Joshua and Wilder throwing those shots, Usyk would have been in serious trouble. Guys like Evander Holyfield and Michael Moorer were able to move up to heavyweight and enjoy a certain degree of success before they were eventually squashed by the larger heavyweights. Holyfield and Moorer could punch at cruiserweight, so it wasn’t hard for them to move up and still enjoy success at heavyweight. Usyk doesn’t not possess excellent punching power for a cruiserweight, which means he’s going to have be a Chris Byrd finesse type of heavyweight. That kind of heavyweight is going to be over-matched against Joshua or Wilder. Those fighters can move and punch. If Usyk is going to move up to heavyweight, then Briedis should do it as well, because he came close to winning tonight. Briedis can pad his record with soft opposition at heavyweight and get ranked high enough to get a big payday fight against Joshua. That’s what all the top cruiserweights are going to start doing, because they can make retirement money fighting Joshua and losing. Murat Gassiev is talking about moving up to heavyweight as well after the World Boxing Super Series is over with. It’s unfortunate that the cruiserweight division is soon going to be emptying and leaving mediocre fighters to grab the vacant titles.